Syrian government forces have now secured most of the eastern Ghouta enclave, the last remaining rebel-held area near Damascus, the capital and the largest city of the Syrian Arab Republic. With Syrian forces nearing full control of the war-torn region, U.S. Ambassador to the United Nations Nikki Haley recently warned, Washington “remains prepared to act if we must,” if the United Nations Security Council fails to act on Syria for its assault on eastern Ghouta. Last week, Russian Deputy Foreign Minister Sergei Ryabkov commented on the critical situation in eastern Ghouta and called on Washington to completely abandon its plans for a military strike against Syrian government forces. “We’ve warned and warned the US that these plans must be unconditionally refused. Any such unlawful use of force, similar to what happened almost a year ago at the Shairat air base, would be an act of aggression against a sovereign state, as defined by the relevant article of the UN Charter,” he said. Washington had the previous experince of launching a military intervention without the consent of the United Nations Security Council, when President Donald Trump lobbed 59 Tomahawk missiles onto Syria’s Shairat airbase in April 2017. Could Syria’s southern border with Jordan be the next confrontation zone in the country’s multiple regional wars? 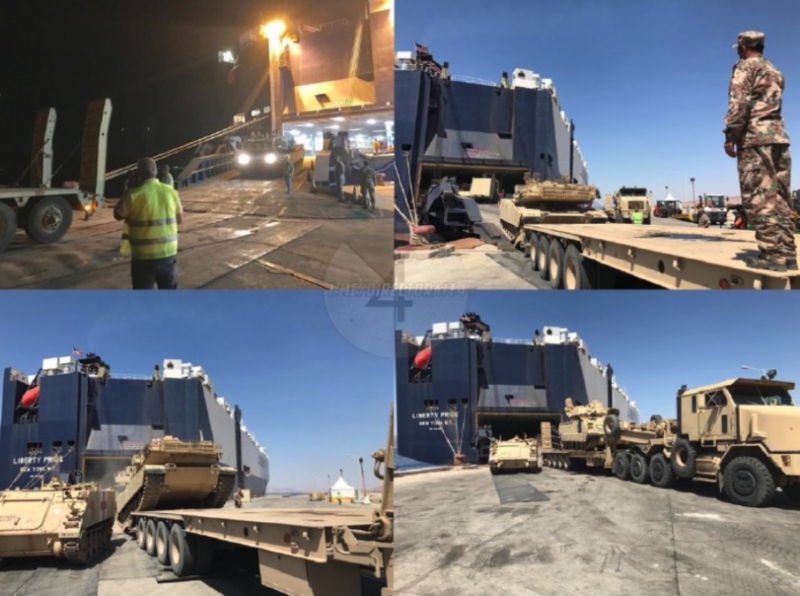 Sputnik news agency recently uncovered leaked images of U.S. military equipment arriving in Jordan’s Aqaba Industrial Port via the vehicle carrier ship “Liberty pride” for the upcoming participation in the annual war drill “Eager Lion.” During the unloading process, the images reveal the “M1A2 Abrams main battle tanks, the M113’s variation for medical evacuation and the M2A3 Bradley armored personnel carriers” were offloaded from the 199-meter (652 feet) military transport vessel, said Sputnik. Sputnik indicates that Eager Lion war drill is an important military exercise between the U.S. Armed Forces and Jordanian Armed Forces, along with Saudi Arabia, Qatar, Kuwait, and Bahrain. Further, the war drill could flare up tensions on the Jordan–Syria border, and as we know, sometimes war drills go live. However, Muraselon news agency ignores the Eager Lion war drill and believes the United States coupled with the Jordanian Armed Forces could be preparing for the next regional war along the Jordan–Syria border. Jordan is a major player bordering southwestern Syria but has been silent as the Russian-backed Syrian regime expanded territorial gains from terrorist groups in the eastern Ghouta region. Now, Jordan seems like it is preparing for a conflict with Syria, as the United States Armed Forces have recently unloaded large amounts of tanks and personnel carriers. Nevertheless, with the return of John Bolton, is war imminent on the Jordan–Syria border?